The senator also backed the independent candidate in the 2010 gubernatorial race. 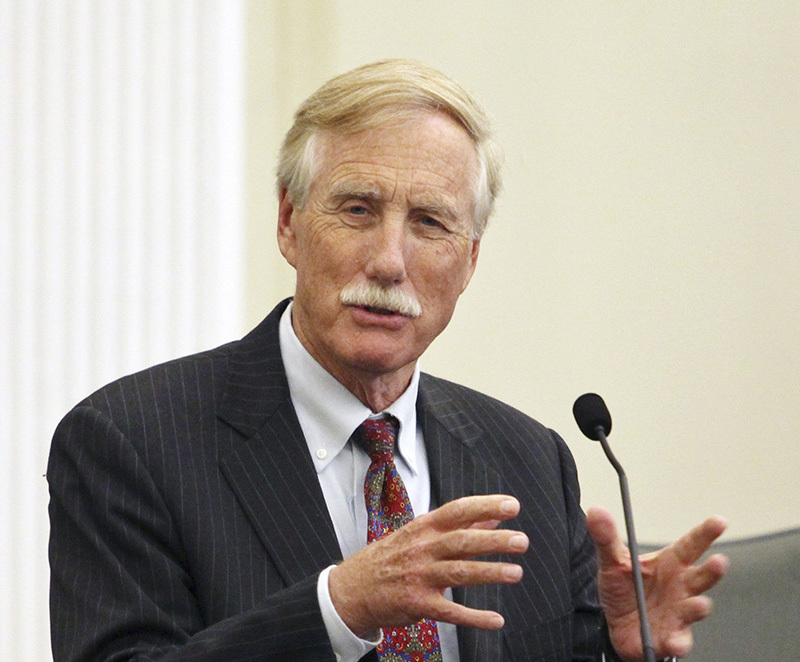 U.S. Sen. Angus King will endorse independent candidate for governor Eliot Cutler on Monday, according to Maine political analyst Ethan Strimling. Strimling broke the news Sunday evening in his blog, “Agree to Disagree,” which appears on Portland Press Herald website. The Democrat, political columnist and former state legislator cited “reliable” sources, adding that he doesn’t think King’s support will turn the election in Cutler’s favor. Kathleen Connery Dawe, King’s communications director, and Crystal Canney, a spokeswoman for Cutler, both said Sunday night they could not comment on whether King was going to endorse Cutler. But Canney confirmed that Cutler has scheduled news conferences for 10:30 a.m. Monday in Portland and 2:30 p.m. in Bangor. She would not disclose the purpose of the news conferences. King, who served as Maine’s governor from 1995 to 2003, is also an independent, and in 2010 he endorsed Cutler’s gubernatorial campaign. King was elected to the U.S. Senate in 2012. Cutler’s opponents in the November gubernatorial election are Republican Gov. Paul LePage and Democratic U.S. Rep. Mike Michaud. Getting an endorsement from a fellow politician is not uncommon, and the LePage and Michaud campaigns said King’s endorsement was expected. Alex Willette, LePage’s re-election campaign spokesman, said that U.S. Sen. Susan Collins, R-Maine, has openly supported LePage’s campaign. And Lizzy Reinholt, a spokeswoman for Michaud, said 1st District U.S. Rep. Chellie Pingree has thrown her support behind fellow Democrat Michaud. Reinholt said she doubts King’s endorsement will swing the election in Cutler’s favor, and she emphasized that it will have no impact on Michaud’s relationship with King. Reinholt said most opinion polls show the race for governor as being competitive between Michaud and LePage. Willette, on the other hand, said an endorsement from King should help boost Cutler’s campaign. Most polls have Cutler trailing a distant third behind Michaud and LePage. Strimling said political history is against Cutler. U.S. Sen. George Mitchell – one of Maine’s most popular politicians – endorsed 1st District U.S. Rep. Tom Andrews to fill his seat in the Senate in 1994. Andrews was defeated by Olympia Snowe. Snowe also campaigned for Kevin Raye in both of his races against Michaud in the 2nd District, and Raye lost both. Willette said he finds it interesting that King chose not to support a fellow congressman. Strimling, who also serves as a senior political analyst for sister stations WCSH-TV in Portland and WLBZ-TV in Bangor and for WGAN radio in Portland, cited a public opinion survey conducted from July 26-28 by the Maine People’s Resource Center. In that survey, respondents were asked whom they would vote for if the election for governor were being held at the time they were surveyed. Michaud would get 42.6 percent of the vote, with LePage garnering 41.4 percent and Cutler 12.6 percent.